Brian has worked in accountancy for 20 years. He started his career with a small accountancy firm in Walsall and went on to work for Price Waterhouse Coopers. 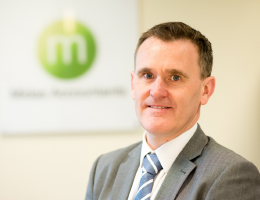 His love for working with SMEs took him to work at an accountancy firm in Shrewsbury before joining the team at Midas. He has experience of working with manufacturing businesses, as well as doctors and owner managed/family run businesses and in his role at Midas he will continue to look after similar clients. Brian is passionate about working with and supporting local businesses. Brian lives in Cheslyn Hay with his wife Julie and their two young children. This year he qualified as a day skipper and says that sailing is something he’s always wanted to do. Now he just needs a boat and more time! His favourite joke is – What’s the difference between a buffalo and a bison? You can’t wash your hands in a buffalo. One thing he can’t live without – good coffee and books. The one thing he would take with him to a deserted island – his own boat.